With a great season comes great recognition. 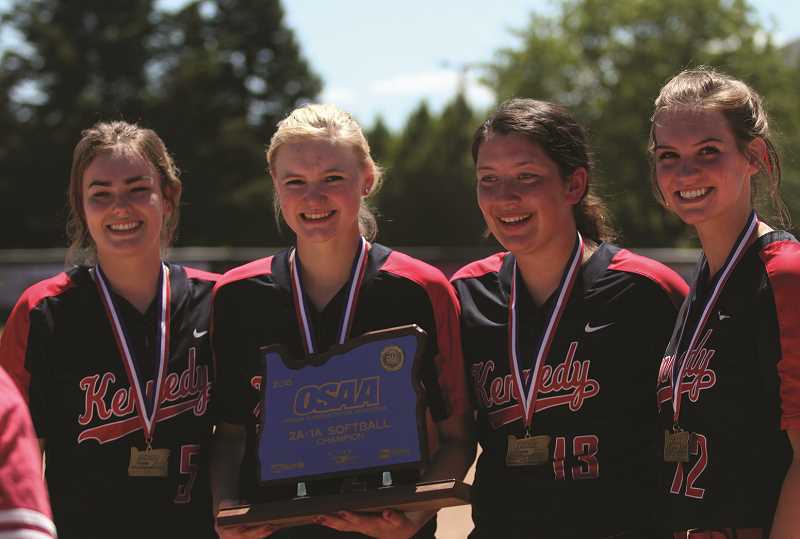 Following the Kennedy softball team's 24-4 season that ended in a 10-0 win over Pilot Rock/Nixyaawii for the first state championship in program history, the Trojans were similarly acclaimed last week by sweeping the top honors in the 2A/1A All-State awards. At the top of the list were senior Tressa Riedman and Head Coach Walt Simmons, who won 2018 Player of the Year and Coach of the Year awards, respectively. Riedman also was named Pitcher of the Year, as all four of the Trojans' seniors earned First Team All-State honors. Catcher Abby Frey, first baseman Molly Jaeger and shortstop Hannah Arritola were named to the First Team along with Riedman, while freshman Ellie Cantu garnered Second Team All-State recognition to round out the team's awards. Riedman swept the team's top two honors by virtue of an incredible season on offense and defense. On the pitcher's mound, Riedman struck out 179 batters in 110 innings over 24 games. In that span, she gave up just 79 hits, 23 walks and 20 earned runs for a 1.27 earned run average. Riedman's season culminated in an 11-strikeout performance in the state championship game, holding the Rockets to just one hit in the shutout to earn Player of the Game honors. She credited much of her career to the help she received from her parents and pitching coach Paige Hall, a former pitcher for the Oregon State University softball team. 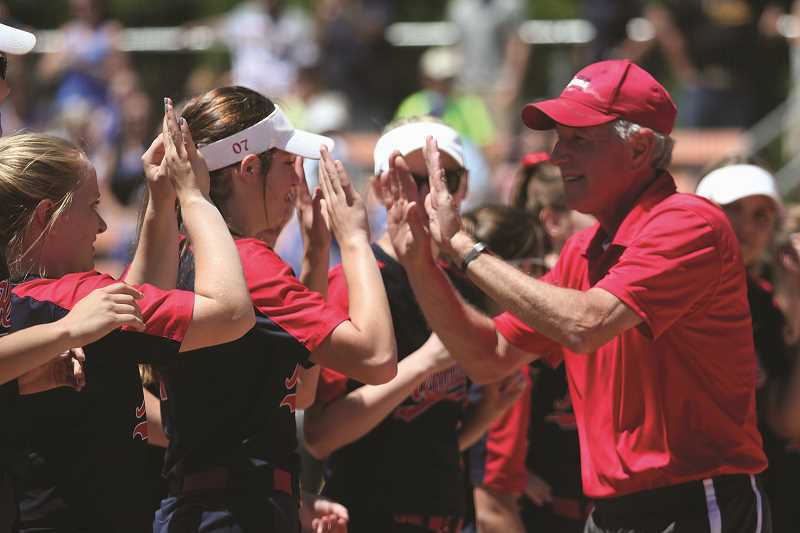 Riedman, who played basketball with Jaeger, Arritola and Frey in middle school, gave up the sport in high school to focus her efforts on softball during the winter months to prepare for the spring season. The practice paid off, resulting in three consecutive Conference Pitcher of the Year awards from 2016-18. On offense, she proved to be the Trojans' most potent weapon as well. As the team's leadoff hitter, Riedman led the team with a 0.561 batting average and a 0.609 on-base percentage. She led the team in hits (46), doubles (7), triples (4) and home runs (4), while driving in 39 runs and scoring 13 times as well. The rest of her First Team colleagues were no slouches either. All four batted above 0.400, with Arritola leading the way at 0.494, followed by Jaeger at 0.481 and Frey at 0.443. Arritola was second on the team with 39 hits, including five doubles and three triples. She led the team with 43 RBIs and scored 30 runs. Jaeger was just behind with 38 hits, six of which were doubles. She drove in 31 runs and scored 33 runs. Frey racked up 27 hits, six doubles and 22 RBIs. She scored just one run, often being subbed out for a courtesy runner. As good as the team was on offense, together, the quartet helped form the backbone of a defense that was among the most potent in the state. The Trojans gave up 75 runs on the season for an average of just 2.68 per game. The team was particularly effective over the final five weeks of the season, posting nine shutouts in the team's 15-game win streak to finish the year, giving up less than one run per game in the streak. The team's final All-State selection, Cantu, was just as effective as her First Team teammate. Cantu hit for a 0.422 average, tallying 35 hits, seven doubles 20 RBIs and a team-best 35 runs scored. Leading the team throughout the season was Simmons and longtime coaching partner Steve Buchheit. The pair has been together at Kennedy since 2003 and have led the Trojans to a number of impressive seasons since the OSAA went to six classifications in 2006. In that span, Kennedy has made the playoffs in 10 of 13 years, including two trips to the quarterfinals, three semifinal appearances and state championship games in 2006 and this year. Simmons has a total record of 206-101 since 2006, including a league record of 145-45.